In this engaging, unusually rewarding book, historian Koehn (Harvard Business School; The Story of American Business: From the Pages of the New York Times, 2009, etc.) examines the lives and skills of individuals who overcame “profound” personal crises to achieve important goals. Her striking choice of leaders—British polar explorer Ernest Shackleton, President Abraham Lincoln, abolitionist Frederick Douglass, German pastor Dietrich Bonhoeffer, and environmental writer Rachel Carson—provides many ways of seeing how vastly different challenges can summon inner strengths that allow certain individuals to motivate others to great purposes. Leaders are made, not born, argues the author. In these perceptive sketches, she shows how these leaders “made themselves into people of character and strength capable of doing extraordinary things.” The disciplined Shackleton led his ice-locked crew to survival (“Not a life lost and we have been through Hell”); Lincoln, ever resilient, saved the Union; ex-slave Douglass became a powerful voice for abolition; Bonhoeffer brought intense focus to his opposition to the Nazis; and Carson overcame illness and many other obstacles to exert quiet leadership against pesticide use and other environmental issues. Without interrupting her narratives, Koehn offers comments on the lessons for today’s leaders and teases out significant traits shared by her subjects: “the harder they worked on themselves, the more effective they became as leaders.” All had a talent for “looking widely, listening carefully, and reflecting constantly.” With consistency, all managed their emotions in the most turbulent moments. Throughout, Koehn underscores the great humanity and depth of understanding of these leaders, from Shackleton’s ministering to the smallest needs of his men to Bonhoeffer’s empathy for the oppressed and powerless. 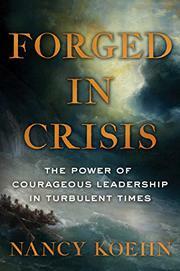 Wise, thoughtful, and valuable, this book will foster a new appreciation for effective leadership and prompt many readers to lament the lack of it in the world today.